As Team Superman continues their battles with the various Doomsdays across the planet Superman learns how to defeat the Doomslayer. 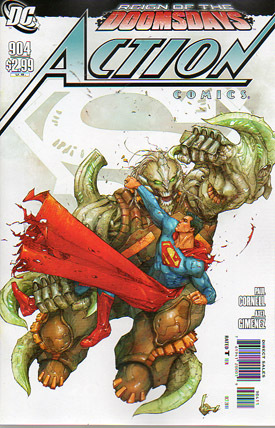 Superman has his final confrontation with the monster and nearly has to follow Doomslayer into another universe when the Eradicator inhabited Doomsday sacrifices himself so that Superman can stay behind. The day is saved and the Doomsdays are defeated. Later Lois and Clark have a long overdue dinner and talk about what Superman means to the world. Lois tells her husband that he is the way he is because of Jonathan and Martha Kent and Clark makes them proud every day. In the end Clark realizes that he went on a journey to find America and after one speech from Lois he realizes that everything important in his life was in Metropolis all the time. Story - 4: This is going to be a weird review to write. My first instinct is to write about the fact that this is the last issue of ACTION COMICS. That's not exactly true, though. This may be the last issue of ACTION COMICS for this particular volume of the title but it is hardly the very last issue because a new ACTION COMICS #1 is coming out next month. Also this isn't the first time that ACTION has had a last issue. Back in 1988 ACTION COMICS became ACTION COMICS WEEKLY beginning with issue 601 and going all the way to issue 642. So while it is a big deal that ACTION is being re-launched it is not unprecedented. That doesn't mean I am not bummed out. This title just got to its 900th issue. That's a big deal. 900 issues (even if 42 of them were under an altered title) is nothing to sneeze at and I could sit here and type paragraph after paragraph about how this is a grave injustice and ask how DC could do such a thing and complain and gripe and do all of that but frankly I just don't have the energy to do so. Am I upset? Yes. Am I annoyed? Yes. Is it an issue that means something to me? Yes. Is it something that negatively impacts my everyday life? Well...no. Actually it doesn't. Because of that fact I am trying to keep the renumbering in perspective. Sure I want to pay my respects but I don't want to lose my mind over it at the same time. The great thing about this "final issue" is that it was extremely entertaining. The writing continued to be top notch and I found myself chuckling and cheering at alternating times. Cornell has such a great handle on who Superman is as a hero but isn't afraid to have some fun with him as well. I loved Superman's dialogue throughout this issue whether he was "talking smack" (for lack of a better term) to Doomslayer or explaining his motivations and the motivations of his friends. It just plain felt like Superman, which is kind of weird because with the Superman and Clark Kent that Cornell gave us here and that Roberson gave us over in SUPERMAN I kind of wonder why they are changing gears with him in the relaunch. THIS is the Superman and Clark Kent I have been wanting and needing to see for literally years now. There were two references that Cornell made that I absolutely loved. At one point Superman explains that he was using the "rope-a-dope" strategy when fighting Doomslayer, which he learned from a friend. I am assuming that Cornell is referring to the classic SUPERMAN VS. MUHAMMAD ALI treasury sized comic from 1978, where Ali taught Superman some of the finer points of the sweet science before using him as a punching bag. The second, and to me more amusing, reference was late in the issue where Clark and Lois are having dinner. Lois mentions that the Chinese want to make Superman an honorary citizen. Clark replies, "Let's not get into THAT again." If that was a dig at the David Goyer written story from ACTION COMICS #900 than I applaud Cornell for having the guts to poke fun at the controversy that story caused. As much as I liked all of that and as much as I liked seeing the Superman Family in action it was the final four pages that really stood out for me. I loved this conversation between Clark and Lois and as much as I have accepted the fact that they are not going to be married after the relaunch it is scenes like this that make me sad that the marriage is going away. Everything you need to know about Superman and about why Lois and Clark are perfect for each other is in the end of this issue. Again with writing this strong it makes me curious why DC is still changing gears with Superman's motivation like they are. Oh well. Trying to figure that out is like yelling at the rain; it doesn't do any good and makes you look kind of crazy. As a wrap up to ACTION COMICS and as a wrap up to the last twenty-five years of Superman I found this issue and storyline to be very satisfying. Just about everyone got to say good-bye and it ended on a very upbeat note. It was also a lot of fun and I think that aspect is the part I liked best. Art - 4: Once again I enjoyed Axel Gimenez's art. Superman looked great as did all of the other characters. The action was intense but Alex managed to capture the more emotional moments as well. I dug Ronan Cliquet's work as well. The art on the last four pages was quiet but managed to capture the mood of the scene perfectly. Overall a great issue artistically and like the writing a fitting send off to this iteration of ACTION COMICS. Cover Art - 5: Once again we are treated to a very dynamic cover. 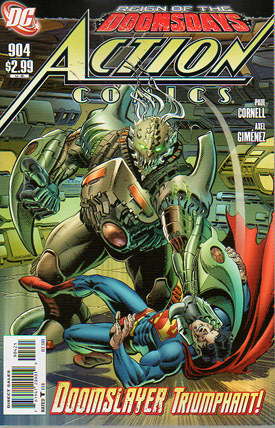 The stark white background accentuates Superman's fight with Doomslayer and I like the white S symbol in the background. Variant Cover Art - 5: I like this cover quite a bit. Superman and Doomslayer both look neat and this is a nice companion piece to the main cover.